When can you really sacrifice a creature? Looks like some changes were made to this deck since the last time. That mana curve is looking a hell of a lot better. 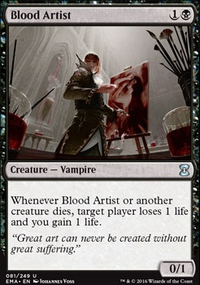 I see a lot of free sacrifice abilities were added to the deck, but still no Smothering Abomination ??! Also, I do not know how I missed this not being on here before: Skullclamp . @HyperViper191: Those are all solid suggestions, but they're kind of meta-dependent. Lightning Greaves & Swiftfoot Boots are good if this deck faces a lot of targeted removal, but considering this deck can run without the commander, I'm not sure they're entirely needed. Selfless Spirit fails to stop Toxic Deluge , Swords to Plowshares , or any other similar effects. Hey, interesting concept for your deck. Consider Bane of Bala Ged ? It's a budget Eldrazi who has annihilator before it was a mechanic, it's annihilator 2. Consider Fierce Empath ? Tutors for an Eldrazi, or any other 6 or higher CMC creature. Consider Smothering Abomination ? It's an Eldrazi and whenever you sac an Eldrazi token for mana you draw a card. Consider Mycoloth ? Not an Eldrazi, but one of the better sources of repeatable tokens each turn for no mana cost. 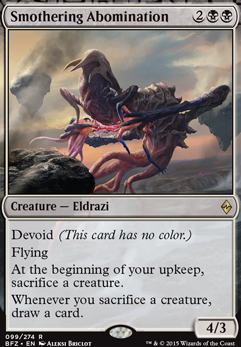 Devour works well with Eldrazi tokens. Consider Evolutionary Leap ? Repeatable source of getting a creature into your hand; sac an Eldrazi token to put a better creature into your hand. If you like some of these suggestions I offer more advice about cuts and other budget options. Good luck with your deck. Liliana, Heretical Healer Flip is something I experimented with, but in the end all I could ever really do was activate her +, which is pretty weak in this deck. But my meta is pretty hard on planeswalkers. Maybe yours is more lenient, idk. Lord of Extinction is sorta just weak here. I mean it combos great with Jarad, Golgari Lich Lord , but how often are you going to christmas-dreamland into both of those two? And Nighthowler is kinda just a worse Lord of Extinction . 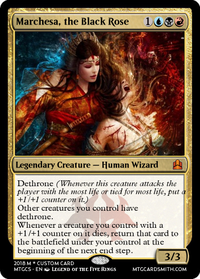 I have played Sheoldred, Whispering One before and, like all of the praetors, all she does is get you targeted to death- especially if you can recur her. 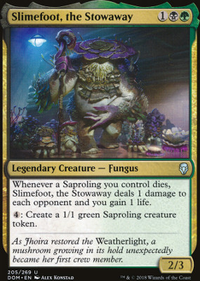 Smothering Abomination and Grim Haruspex WILL draw you to death in a deck like this (a deck where you have no real wincon other than Plaguecrafter away your opponents' boards and chip in). Deadbridge Chant 's randomness makes it pretty bad. You're aiming to have like 10 or 15 cards in your grave by the time you play this, it makes that number 25. 1 in 25 is not very good. Like the card is a decent value engine, but it's not likely to get you what you're looking for. 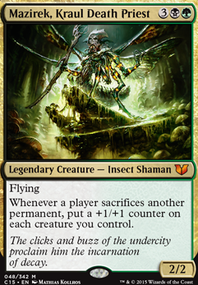 You have a lot of cards that I looked at and though ... "but you can get a creature to do that." 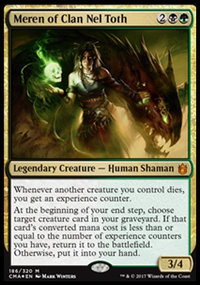 Krosan Grip , Green Sun's Zenith , Reanimate , Grave Pact ? All have creature alternatives. Thragtusk : a BIG pillow to lie back against- five life and two blockers! Shadows of the Past : so. many. scries. Day of Judgment should be good, old fashioned Wrath of God . Hero's Downfall belongs in your removal package.